At the feet of the bronze Matador statue, Gov. 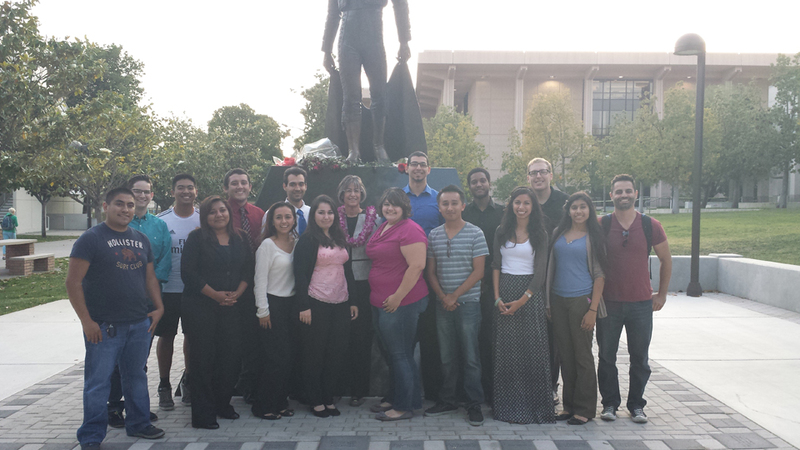 Linda Lingle (back row, center with purple lei) and her political science seminar class gather for their last meeting. Photo courtesy of Jessica Markham. Some undergraduates expect to learn from the brilliant minds of major social figures, but only a handful of students get to realize this grand dream. At California State University, Northridge, this dream came true in former Hawaii Gov. Linda Lingle’s Political Science 471A seminar. Lingle ’75 (Journalism) noted at the beginning of the spring semester that she planned to use her contacts and 30 years of experience as a public servant to give the more than 20 students a taste of public policy. Minassian was the only sophomore in the seminar course — usually reserved for seniors and second-semester juniors — giving her a fresh take on the application of her studies to the real world. Beyond that, she became acquainted with a highly supportive environment that promoted critical thinking, public speaking and strong writing, she said. The course was based on three projects. Students were asked to present a speech and brief — a memo no longer than three pages, according to Lingle — on a local, state and national policy. Points of view from which presentations could be given included lobbyist, politician and activist. The class heavily emphasized writing, and the students were expected to meet high standards. Lingle was also able to help students stretch beyond their skill sets. For Diana Benitez ’14 (Urban Planning), the only non-political science major in the seminar, this meant relating the world of policy to her academic background. Students learned through texts and practice, as well as anecdotes from Gov. Lingle and her array of guest speakers. The governor’s own connections led to class discussions with her former staff, including Linda Smith, Lingle’s senior policy advisor, and Corrie Heck of her communications team. Discussions also included local political celebrities such as L.A. County Supervisor Zev Yaroslavsky and Bipartisan Policy Center President Jason Grumet. Lingle’s connections with Congress also provided the class a second chance to chat with Sen. Susan Collins, R-Maine, who had a public speaking engagement on campus over lunch. The intimate lunch was only one example of networking opportunities provided by Lingle’s experience and know-how. Networking was a key part of the class, said Minassian, who began to connect with guest speakers. Visitors were able to provide students with their own life stories and hardships that led them to their current positions. The variety of fields represented also helped students see themselves in niches relevant to their interests. Ultimately, the students loved the course and admit to having learned more than they anticipated in a senior seminar.